Chanda currently lives in Portland, Oregon, where she joined Oregon College of Art and Craft as a Visiting Instructor and manager of the ceramics studio in 2017. Her diverse studio practice ranges from installation to utilitarian ceramics, and is inspired by objects of industrial design and fashion, especially mid-century design and decor. Chanda is connected to the national field of ceramics through her various teaching appointments, residencies and non-profit board service. Chanda has previously taught at a Doane University, Indiana University Southeast, and Florida Atlantic University. She has done artist residencies at the Houston Center for Contemporary Craft, Columbia College, Red Lodge Clay Center, and Bracker’s Good Earth Clays, as well as spending a summer in Maine as a studio manager at Watershed Center for Ceramic Arts. She completed her MFA at Kansas State University in 2011 and received her BFA from Buffalo State College in 2008. From 2010 to 2012 she served at the Student Director at Large for the National Council on Education for the Ceramic Arts. Chanda has recently had solo exhibitions at the KOA Gallery in Bradford, PA and the Rall Gallery in Crete, NE. She is represented by Eutectic Gallery in Portland, OR and Asher Gallery in Houston, TX and has exhibited at various venues including the Houston Fine Arts Fair, Baltimore Clayworks, Red Lodge Clay Center, Carbondale Clay Center, the annual NCECA conference and the Jingdezhen Ceramic Institute in China. I am in love with objects. Sometimes new objects, but usually old, used objects that speak to me of their past life. I want to own them, possess them, intimately explore their curves and corners, dimples, dots, swirling lines or smooth broad planes. When I find an object I particularly love – an ashtray, a candy dish, a lampshade, even a toilet plunger – I make a mold so that I can recreate it again and again. I pare the object down to pure form, taking away original function, color, and material, leaving nothing to distract from the beauty of the original design. I assemble and re-assemble these forms, at times combining various bits and pieces into new objects, alternately using the casts in an unaltered state, repeating each form multiple times, building larger abstract installations, creating emphasis through repetition. Light and shadow on lustrous white ceramic surfaces emphasize the lines and planes that originally called to me. 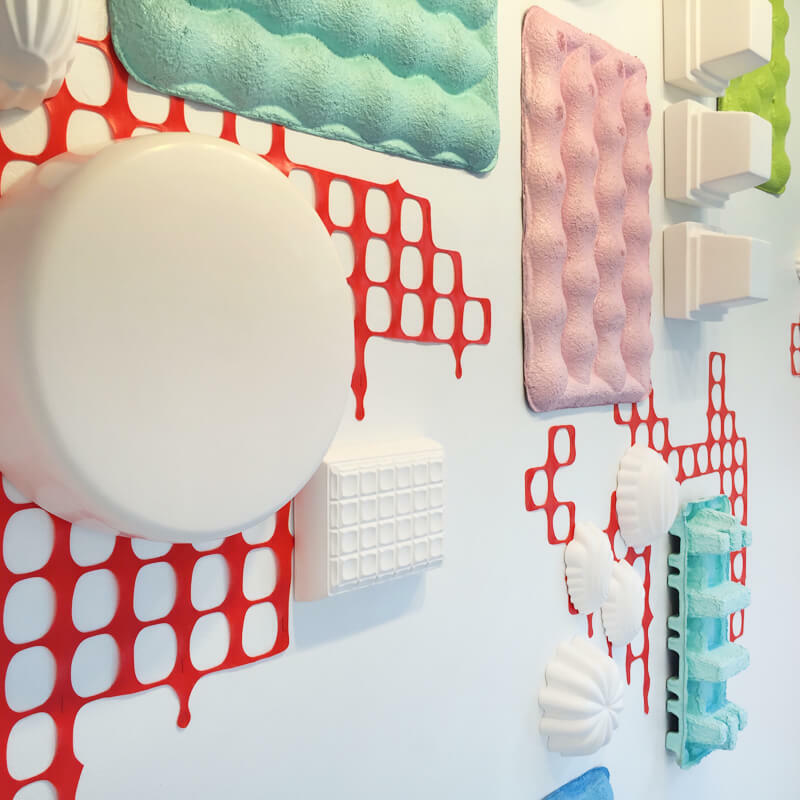 I add in other materials, balancing an abundance of color and texture with the purity of the ceramic forms to create large compositions that encompass walls and rooms.